Happy Spring to all WWSC Members! We hope all members are well and are enjoying the arrival of spring, particularly in your woodlots. It’s certainly a favourable time of year with life emerging and birds singing. We are pleased to say the WWSC has now completed our first full year of operation! This milestone is the result of years of hard work by our dedicated working group which, since our inauguration last spring, has transitioned into an interim board of directors, dedication from our general manager, and of course financial support from NSDNR. Our aim continues to be a ‘one-stop-shop’ for private woodlot owners within the seven western counties providing a wide range of management and operational services to meet your woodlot needs and objectives. 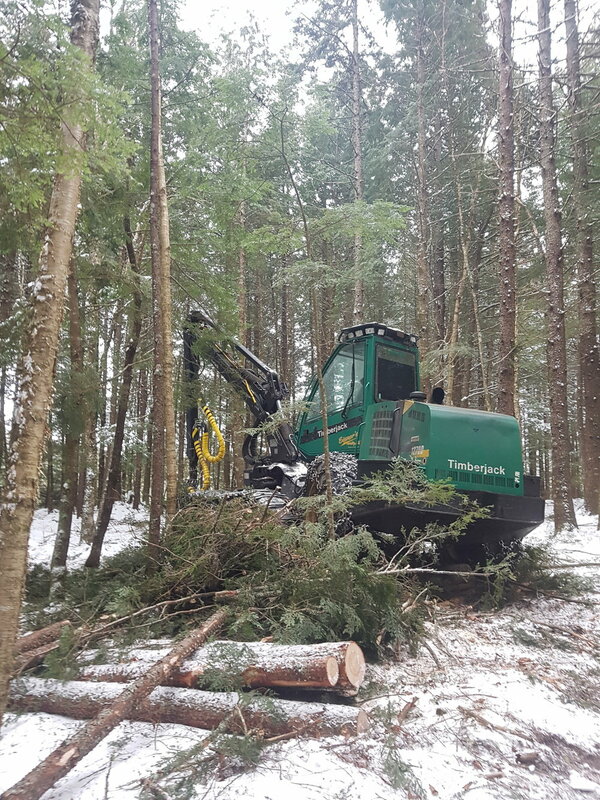 We are now fully operational and providing services to our members and encourage you to get in touch with us if you are looking for some guidance, interested in updating your management plan, or completing harvesting and/or silviculture on your woodlot. We’re really happy with the growth of the WWSC membership this year, and we’ve seen significant interest from both woodlot owners who have been managing their woodlots for generations and those new to woodlot ownership. The current membership of WWSC is 87 members representing almost 22,000 acres across the seven counties. 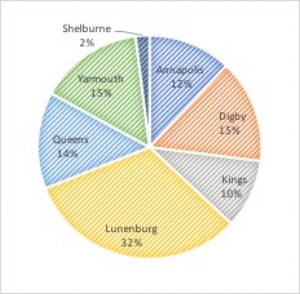 Currently, the majority of our members are from Lunenburg and Digby Counties and the average area per member overall is fairly large at 251 acres. We’re working hard to establish efficient access to services for our members, and hope we can continue to see rapid growth of the WWSC moving forward. Remember to tell your fellow woodlot owners about the WWSC - the more members we have the easier we can access markets, silviculture funding and government support. We can work better together than individually. WWSC Member Distribution by County. In 2018, the WWSC has been involved with assisting and planning 3 harvest jobs: 2 commercial thinnings in Digby County and 1 of partial harvest in Lunenburg County. The total area of these jobs was 125 acres, and the total volume of sawable products (sawlogs and studwood) sold thus far is just over 2000 tonnes. The WWSC has also marketed approximately 1500 of ‘self-harvested’ wood, from those industrious woodlot owners that have the ability to harvest timber on their own. We now have a queue of additional harvest and silviculture jobs we’re working on helping our members accomplish this year. All 3 of the harvest jobs we’ve assisted with this year thus far received silviculture funding to help offset the costs associated with forest tending. 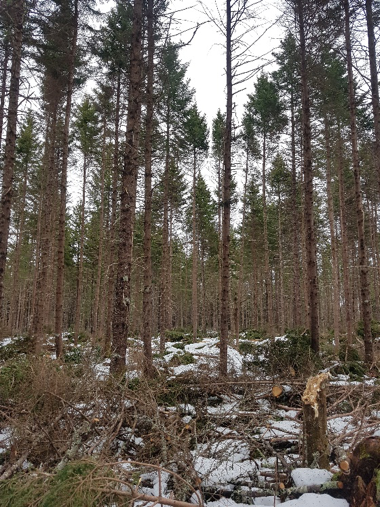 For members with more juvenile stands, we have pre-commercial thinning jobs underway which are also eligible to receive silviculture funding. This spring the WWSC received a small budget from the Association for Sustainable Forestry (ASF) to help serve our members, and we’re looking to develop budget sharing to provide our members with easy access to funding moving forward. The WWSC is looking forward to hosting various demonstration field days or workshops for our members over the next year, keep posted to our website and your inbox for details! Photos above show the harvests we completed early this year. 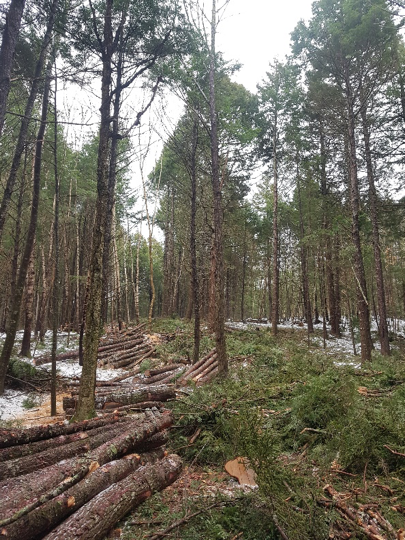 The two images to the left are from a commercial thinning in Digby County and the two on the right are from various partial harvest treatments completed on woodlot in Lunenburg County. We’re pleased to announce that WWSC’s first AGM will be taking place on Saturday, June 9 from 9:30 am to 2 pm at the Annapolis Basin Conference Centre in Cornwallis. The AGM will act as a forum to hear from our members as we develop the structure of the WWSC and form our official board of directors. We are delighted to have the General Manager of North Nova Forest Owners Cooperative, Greg Watson join us as a guest speaker and share North Nova’s story as they celebrate 40 years in operation as a successful woodlot owner managed cooperative. Mark the event on your calendar today and please contact us to pre-register by May 26th, as lunch will be provided. Thank you and looking forward to seeing you at the AGM on June 9th!